The spy 3G hidden wall clock camera With Removeable Battery allows you to access live video and audio from most anywhere on earth, on your 3G smart phone. The spy 3G hidden wall clock camera is a small wall clock camera sends you see the video of what is going on when you are not there. The spy 3G hidden wall clock camera operates over the 3g network, and you don't need a computer. 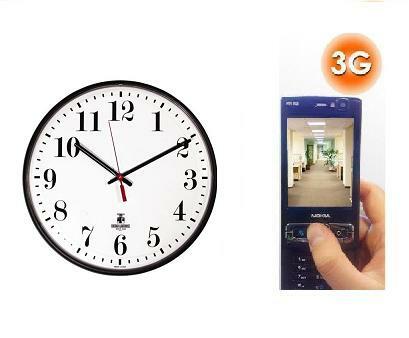 Just call the spy 3G hidden wall clock camera from your phone to watch and hear the video. Compatible with any 3G SIM card across all 3G networks, it is easy to set up and use, simply insert your SIM card and battery, and you're up and running. Make a video call from any 3G phone to the camera to watch and hear live video and audio. The camera will continue working for up to 100 hours using a backup battery when disconnected from the mains power. Internal & external Industry, Office, Home, Child care, Elderly care, Vehicles, Banks, Shops, Fly tips etc.